Revolutionary in design, WellnessMats have a smooth, sleek structure and are incredibly supportive and resilient. 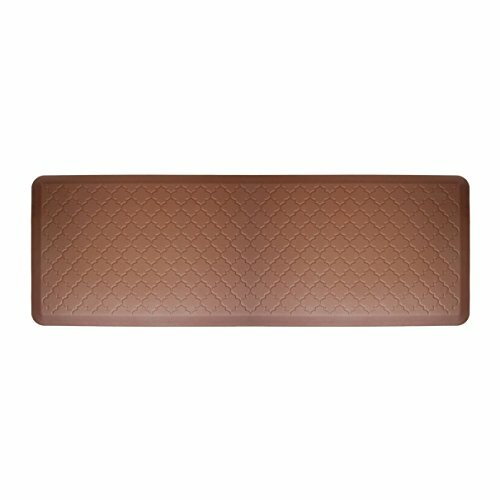 With a brown polyurethane design, this mat features a Moire checkered motif. Anti-microbial and resistant to dirt and stains, it is also heat and puncture resistant and it will never curl or delaminate. WellnessMats proudly backs each mat with a 20 year manufacturer's warranty against any defects in materials and workmanship. This 20 year manufacturer's warranty includes a seven year performance warranty to ensure that each mat will remain unmatched in comfort, always lie flat, never delaminate, and never compress. Made in the USA, the WellnessMats are a comfortable and stylish way to suspend body weight and increase blood flow to the extremities. Supreme Diamond Foot Anti Fatigue Floor Mat Black/Yellow 3' X 10' X 11/16"